Benign T-wave Inversion from HQMedEd on Vimeo. There are many etiologies of T-wave inversion. We are most worried about ischemic T-wave inversion. Wellens' syndrome is particularly dangerous, as it signifies an unstable critical LAD stenosis. I have several posts on this; here is one that shows the entire evolution. Another etiology is "Benign T-wave Inversion", which has long been recognized. I first saw it described in Chou's textbook. It is a normal variant associated with early repolarization. K. Wang recently studied it. He reviewed ECGs from all 11,424 patients who had at least one recorded during 2007 at Hennepin County Medical Center (where I work) and set aside the 101 cases of benign T-wave inversion. 97 were black. 3.7% of black men and 1% of black women had this finding. 1 of 5099 white patients had it. Aside from an 8.8% incidence (9 of 109) black males aged 17-19, it was evenly distributed by age group. 2. The leads with T-wave inversion often have very distinct J-waves. 4. The T-wave inversion does not evolve and is generally stable over time (in contrast to Wellens', which evolves). 9. II, III, and aVF also frequently have T-wave inversion. I show you the LAD-BER formula calculations, but remember, strictly speaking, this was not studied in ECGs with: 1) T-wave inversion, 2) coved (upwardly convex) ST segments, or 3) LVH. Here is the formula; there is an excel spreadsheet down the right side of this blog: (1.196 x STE at 60 ms after the J-point in V3 in mm) + (0.059 x computerized QTc) - (0.326 x R-wave Amplitude in V4 in mm). A value greater than 23.4 is quite sensitive and specific for LAD occlusion. Benign T-wave inversion: There is ST elevation in V2 and V3, with T-wave inversion in left precordial leads. QTc = 395ms, formula value (to determine if the STE is STEMI or not) = 21.13 (< 23.4 is early repol). Note the prominent J-waves, the minimal S-waves and the prominent R amplitude in leads with T-wave inversion. Benign T-wave Inversion: This has some scary looking STE and TWI. QTc is 415ms and formula value is 21.39. Benign T-wave inversion and probable LVH. Scary ST elevation, right? But QTc is 421ms and formula value is 20.17. Benign T-wave Inversion? QTc 398, formula 17.6. This one was not stable. The next day it was gone. It was recorded in a young black male with chest pain. There were negative serial troponins but no angiogram. Dr. Wang considered it to be BTWI. Wellens' syndrome. Note the evolution from A to C. It begins with terminal T-wave inversion (biphasic) in lead V2, later extends to V3 and V4, and still later becomes deep and symmetric and only then extends to V6. There was a critical LAD stenosis. In this case I do not know what the computerized QTc was. This is taken from an article I wrote in EM Clinics of North America 2006;24(1):53-89. Labels: anterior T wave inversion, Benign T-wave Inversion, Wellens' Syndrome - NOT!! in the 5 examples of BTWI on your video, every one of them had small T wave inversions in leads II, and aVF...3 out of 5 had T wave inversions in I and III as well. Is there any significance to the diagnosis of BTWI and the T wave inversions in the limb leads? I've been so focused on the precordial leads, I didn't even noticed that. 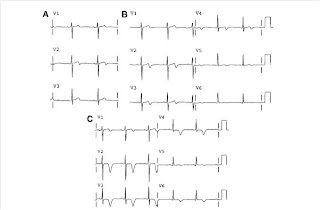 From the strips you showed, the aVL's had that S that we see in repolarization abnormalities. Is there a value for its sn/sp of being benign or not benign. I'm not sure what you're referring to ???? 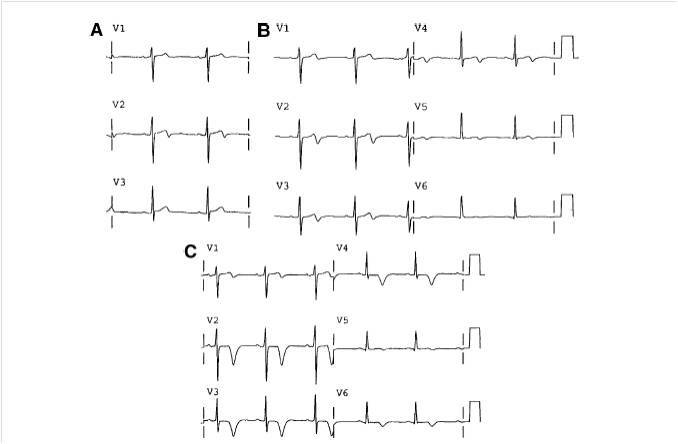 Sorry for that description but what I mean is the terminal nib or what seems to be a distortion at the end of the QRS complex in aVL's (strips 1-5 in the BTWI images) or can we say r. They seem to have same morphology on the chest leads showing repolarization abnormalities. Does it have any significance (like sn/sp) (in this scenario) or they are just present on these sample strips? I hadn't noticed and I'm not sure. But good observation! Hello Dr Smith, I wanted to discuss a case with yourself. I was asked to give advice recently for a young 37 year old, male, south east asian patient. He was admitted with headache, no chest pain. Had a recent fall, subsequently developed headache. CT head was fine. He had t wave inversions in I,avl, v5 and v6 with biphasic t wave in v1 and v2 as in wellen syndrome. Although he did not have any chest pain but he had risk factors as increased cholesterol, +ve family history and he was a smoker. i know we do not treat ECG and we treat the patient but I was kind of reluctant to discharge him with that kind of Ecg and with risk factors. What would your advice be? What if I have T wave inversions in V3 and V4? Is it normal? If not what is it due to? What if I have T wave inversion in V3 and V4? Is it normal? If not what could have caused it to be so? Dr Smith, how to distinguish benign T wave inversion from T wave inversion due to apical hypertrophic cardiomyopathy? I find them very similar.